Dr. Dirk Riehle is the first official open source college professor in Germany. At the Open Source Forum at CeBIT, the former businessman described the new career model. 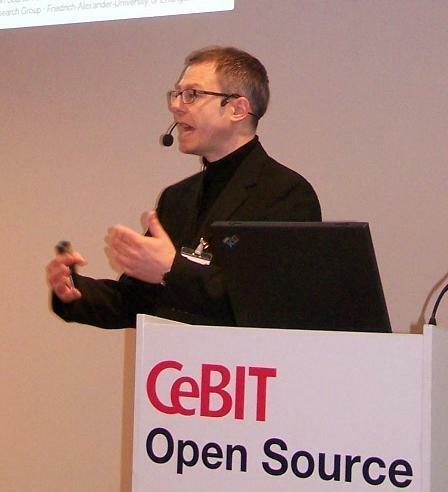 Professor Dirk Riehle in his Open Source Forum talk at CeBIT covered the specifics of programmer careers in the open source arena. "It's hard for me not to look at the economic context of open source," said the newly installed open source professor almost apologetically at the beginning of his Open Source: a New Developer Career talk at CeBIT. The difference between the classic developer and his new counterpart writing software for an organization is the quintessential "to earn versus to be recognized." Riehle suggested that developers in the open source world for the most part have to prove "peer certification" apart from the obligatory technical and social skills. This is reflected, for example, in the project community's acceptance and implicit acknowledgment of upstream contributions. Open source developers can further build their reputations partly through contributions to source code and also by documenting their efforts on mailing lists. This transparency also has an advantage: the developer has a much higher likelihood of finding effective collaborators. Riehle was named Professor of Open Source at the Computer Science Institute of the Friedrich-Alexander University in Erlangen-Nuremburg, Germany in 2009. In the 10 years prior to his academic calling he was in banking IT and worked among other things in the SAP realm.